Rexhame Beach is on the South Shore of Massachusetts. 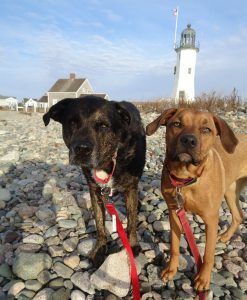 It is one of the few coastal New England beaches that permit dogs all year around. There are also trails nearby, included along the South River. A fee is required to park during the Summer months. We had a wonderful, relaxing, and uplifting Adventure to the Rexhame Beach. It was so nice to be out exploring again, and spending a summer afternoon at the Beach. I was stunned on arrival to see the parking lot was predominantly empty. Although it was a cloudy, cooler day, it was a pleasant surprise to find such a quiet location. We walked through the fence near the dunes before arriving on the Beach. The Beach was covered with colorful round rocks, adding texture and color to the sand. The waves were medium in size, but roaring, and current- driven. Shadow appeared uneasy with the waves, but we waded a bit before finding our perfect sandy spot on the beach. Shadow quickly enjoying rolling in the sand, digging, and some extra-relaxed napping. We spent time, taking in the sounds and sites, letting the worries of life fade away. The peace of a tranquil beach setting cannot be underestimated. Pure perfection! After spending some time at the Beach we found a trail leading over to the “River”. We were told about the “River” by a fellow dog lover, and were awed by this unique feature. Shadow quickly jogged to the River, heading in for an immediate swim. We met some other dogs enjoying romping off-leash. There were benches along the trail, and some colorful flowers. Although nothing fancy, I really loved this find, and I think Shadow too. We were so happy to have a wonderful adventure, and find a dog friendly beach. So glad to be headed back to our life of Adventures. We missed the company of our little Wilma Mae but we still had a fabulous afternoon exploring Rexhhame Beach, and the nearby trails (Rating: Beach – 3, Experience – 5).